This isn't just any Pi Day. It's singularly the most perfect Pi Day that will ever happen in your lifetime. For 24 hours, Pi Day 2015 will be the one and only Pi Day in the next 100 years that will actually reflect the first five numbers in everyone's favorite irrational number, pi, which is 3.1415. And—get ready for this—at 26 minutes and 53 seconds after 9 a.m., we will pass a date and time represented by the first 10 digits of π. Very exciting! If you miss it, there will be one more chance at 9 p.m. After that, you’ll have to wait another 100 years for that auspicious moment to happen again. Math nerds everywhere: Rejoice in the sweet, sweet sequential glory of the day. Eat some pie. Do some math. Time really is a flat circle. 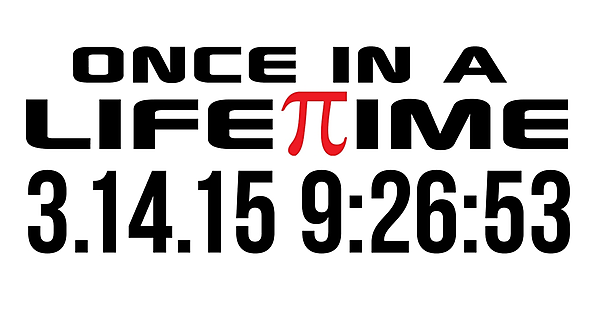 Pi day is celebrated on March 14 at the Exploratorium in San Francisco at 1:59 a.m. PST which is 3.14159. This time will be extra special on 3/14/15, so hopefully something amazing happens, like unicorns turn out to be real or something. There are no occurrences of the sequence 123456 in the first million digits of pi, which makes this Pi Day one million times more special than any other sequential date ever. Ever ever. Ever ever ever. In the Greek alphabet, pi is the 16th letter. In the English alphabet, p is also the 16th letter, further proving pi is the same in every language. Some people believe pi contains the answers of the universe. Albert Einstein was born on Pi Day. The fact that people find this mind-blowing is completely relative. 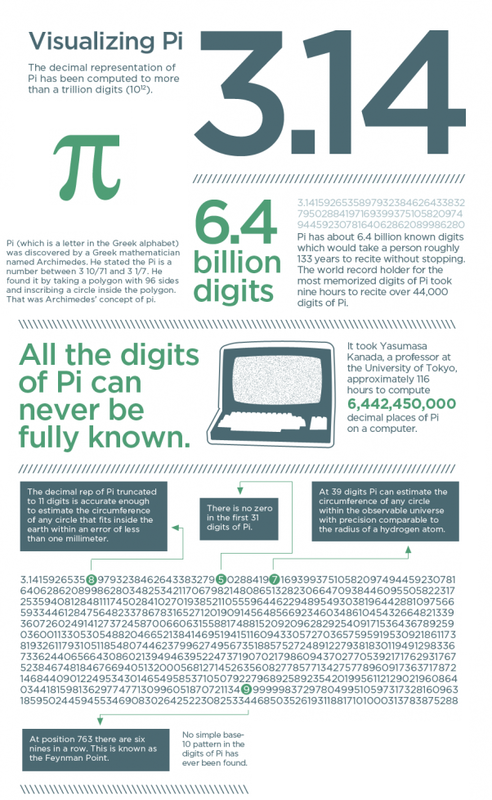 Pi has 6.4 billion known digits that would take approximately 133 years to recite without stopping. Even if they do manage to make it to the next Super Pi Day (thanks to advanced in medical science, probably, we're just guessing), they'll probably be too old to enjoy it. It is more correct to say the a circle has an infinite number of corners than to say a circle as corner-less. Many heads have exploded thinking about this concept. Some scholars claim that humans are programmed to find patterns in everything because it’s the only way we can find meaning in our work. But obsessing about math is infinitely better than obsessing about Kim Kardashian's hair. In the Star Trek episode “Wolf in the Fold,” Spock foils the evil computer by commanding it to “compute to last digit the value of pi." Spock is the only being who can rationally solve a problem using an irrational number.